The choice to return to the very active life I experienced while growing up, has brought many good things into my life. This journey began with a few runs, while still a smoker, fitness classes at the YMCA which led to quitting smoking, cold turkey. With all the excess energy of being more fit and tobacco-free I began to run regularly, first a mile and then a few months later, a marathon in 4 hours and 11 minutes. 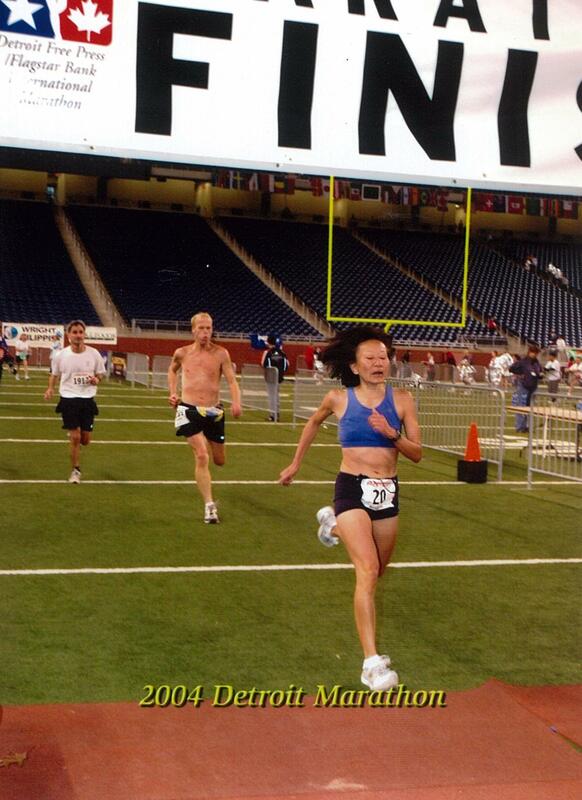 In 2005, I celebrated 30 years of running for fitness and friendship with my 20th marathon, surpassing the Boston qualifying standard by 33 minutes. One of the good things was meeting my husband 33 years ago where he introduced himself in a YMCA cafeteria after the Peterborough Half-Marathon. He remains, my favourite running partner. We have a 30 year old son, 17 nieces and nephews and 5 grandnephews and grandnieces. Highlights of my racing career came later in life; 1st place finish in the 50-54 category at the Chicago Marathon, 3rd place (50-54) at the Boston marathon and a time of 3 hours & 10 minutes at the Detroit Marathon, run at age 50. I like to refer (or brag) of having qualified for the Boston Marathon in the Open Men’s category at age 50. After retiring from racing the marathon in 2013, I began to focus on track distances and set a few Canadian indoor records and attended my first World Championship track meet in Daegu, South Korea. I raced the 3K and was surprised to end up with a Silver Medal. This time also qualified as an Ontario 50-54 age group record for the marathon. The time I am most proud of from my younger days is having run my 4th half-marathon in 1 hour & 23 minute after less than 3 years of running and with low-mileage training due to chronic ankle injuries. Gday from Downunder – I like the look and feel of your blog and it caught my interest having been a past marathon runner in NZ – well done!! I am interested in your “Share this” at the bottom of posts is it a down loadable widget, can you tell I am a new blogger.